This week our CSA members are receiving beautiful bunches of beets and carrots (along with many other seasonal gems!) and I couldn’t wait to prepare this lovely platter of roasted roots. We tossed the veggies in some oil and a touch of honey before roasting them until tender. They got tossed in a carrot-top and parsley pesto which was made even more delicious with the addition of Marcona almonds. I don’t buy Marcona almonds often (they’re quite expensive) but they are a total treat and were absolutely worth the pretty penny for this salad. This is a great dish to whip up if you are expecting company or you’re in charge of a side dish to bring to a party. If you can’t find carrots with their tops still in tact go ahead and just add extra parsley instead. Also- if you want to make this a complete meal, try boiling up some pasta noodles and serve the hot pasta with the pesto and roasted veggies–we did this with leftovers and it was divine! Anyhow, however you choose to serve this dish, it’s the fresh flavors of the season that are the show stoppers so you really can’t go wrong! In a large bowl toss the chopped carrots and beets with the oil and honey. Season to taste with salt and pepper. Place on a parchment lined baking sheet and roast until the veggies are fork tender and lightly browned. About 25-30 minutes. Toss halfway through cooking. 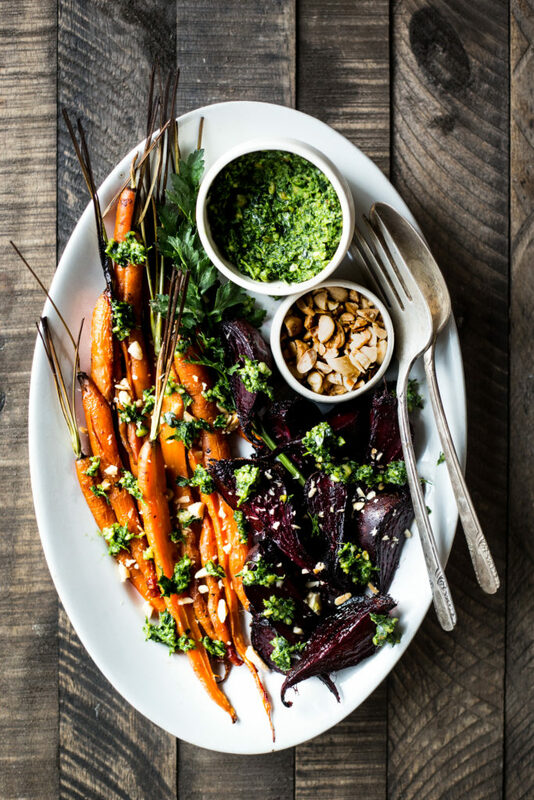 Place the veggies on a platter and drizzle with the pesto, chopped almonds and additional salt and pepper to taste. Serve warm or at room temperature.